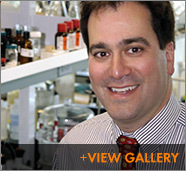 When Chad Mirkin first came to Northwestern as a chemistry professor in 1991, he argued that applications in nanotechnology could catapult the university and Chicago to the forefront of scientific enterprise in the emerging field. These were big ambitions, considering that Mirkin's focus is really, really small—he works with particles one billionth of a meter in size, or 10-9 to be exact. Mirkin was also an early champion of nanotechnology, which most people at the time saw as the stuff of science fiction, a far-out fantasy that appeared only in movies such as Isaac Asimov's The Fantastic Voyage or Honey, I Shrunk the Kids. Mirkin's plans didn't fall on deaf ears. In 1995 Northwestern President Henry Bienen met with Mirkin and chemistry professor Mark Ratner and was deeply impressed by what he saw as a convergence of like-minded scientists ready to tear down disciplinary boundaries and create a world-class nanotechnology enterprise encompassing chemistry, biology, physics, engineering, and medicine. Thanks to that extraordinary meeting, today Northwestern is home to the renowned International Institute of Nanotechnology (IIN), which oversees more than $500 million in nanotechnology research that reaches into virtually every industry, including health, electronics, transportation, and the environment. At the epicenter of all this activity you'll find Mirkin, who is IIN's director as well as the George B. Rathmann Professor of Chemistry in Weinberg College and professor of medicine, chemical and biological engineering, biomedical engineering, and materials science and engineering. If that weren't enough, Mirkin also serves on President Obama's Council of Advisors on Science and Technology and is the founder of three Chicago-based companies that bring nanotech inventions to market. And in January, Thomson Reuters Essential Science Indicators proclaimed him the world's top-ranked chemist in the last decade, in terms of papers published (more than 200) and cited (18,000 citations and counting), a testament to the breadth and influence of his discoveries. Despite his remarkable achievements, Mirkin remains disarmingly down-to-earth in person. When asked what it means to him personally to be the most widely cited chemist in the world, Mirkin replies, "To me, impact is about what we've produced and how people use it." Such grounding in real-world concerns is a hallmark of Mirkin's explorations in nanotechnology, which quickly attracted widespread attention. In 1996 Mirkin was looking for a way to make gold nanoparticles with DNA on them to use as a construction material. His lab, in collaboration with Professor Emeritus Robert Letsinger, first figured out how to immobilize synthetic DNA on a gold nanoparticle, and then discovered, almost by chance, that this nanoparticle solution turned from red to blue when the particles encountered complementary DNA. "The students and I said almost in unison, 'We found a new detection system for DNA!'" Mirkin explains. "It's like a litmus test for DNA. We knew right away that this was something that would have legs." They were right, of course—the implications of this discovery were profound. Results of the experiment were published in the paper "A DNA-based Method for Rationally Assembling Nanoparticles into Macroscopic Materials," which appeared in Nature magazine and became one of the most extensively cited papers in science throughout the decade. Over the next ten years Mirkin and his team worked on applications of these materials, which they found could act as a particle probe for certain diseases. Their projects eventually led to the creation of the FDA-cleared Verigene® System, a molecular diagnostic system used today in hospitals around the country that was developed through Nanosphere, one of the companies Mirkin founded. The Verigene system is currently used to test for diseases ranging from cystic fibrosis to influenza to cardiovascular disease to cancer to blood coagulation disorders. Mirkin's creation of DNA-modified gold nanostructures also led to his founding of AuraSense, a company that designs gold nanoparticles to be used in treating cancer and heart disease. According to David Walt, Robinson Professor of Chemistry at Tufts University, "Chad's research in nanomaterials spans the range from the most fundamental science to incredibly creative applications. Hundreds, if not thousands, of scientists have adopted his methods. More importantly, Chad has a keen knack for identifying important practical problems that can be addressed by his discoveries and finding a way to mobilize the resources to make it happen." Indeed, Mirkin holds more than 360 patents and applications of nanotechnology products. Timothy Swager, John D. MacArthur Professor and head of the chemistry department at M.I.T., adds, "Chad's brilliance lies in his ability to recognize and develop powerful new nanoscience based upon chemical insight." Another of Mirkin's groundbreaking discoveries is Dip-Pen Nanolithography (DPN), which uses an atomic force microscope to write with molecular ink. It can be used to print nanoscopic features made of proteins, DNA, and other biological material, and has widespread applications in electronics, information transfer, and medical diagnostics. DPN has become an innovative research tool that lets scientists better understand how cells function and interact with surfaces, how they respond physically and chemically to miniaturization, and how they behave at the single particle level. This is vital, because the properties of almost any material change drastically when reduced to the nanometer length scale. Gold, for instance, becomes red on the nanoscale level, and its melting temperature can be lowered by hundreds of degrees. Mirkin's lab in collaboration with Dr. C. Shad Thaxton, an assistant professor in the Feinberg School of Medicine who trained in Mirkin's lab, made headlines most recently for developing nanoparticles that act as a weapon against cholesterol. They figured out how to create new synthetic high-density lipoprotein (HDL), the "good" kind of cholesterol that carries "bad" cholesterol away before it can clog vessel walls and lead to strokes and heart attacks. The surfaces of the synthetic particles are coated with lipids and proteins, making them bind with the cholesterol to transport it through the bloodstream. With such revolutionary discoveries comes recognition, and Mirkin has received an astonishing array of honors over the years. His recent awards include the $500,000 Lemelson-MIT Prize for scientific innovation, which he won in July 2009. This spring, he was elected a member of the National Academy of Sciences, and named an Einstein Professor of the Chinese Academy of Sciences, which recognizes groundbreaking scientists all over the world. Later this year he will travel to China for a lecture tour organized by the Chinese Academy of Sciences. Mirkin often travels internationally, giving between 50 and 70 lectures a year. That seems fitting given his unusually peripatetic childhood. His father, an attorney and federal administrative judge, joined the U.S. Peace Corps when Chad, the youngest of four boys, was only three years old. The family spent several years in Korea (where they adopted a Korean girl) and Malaysia before living in Washington, D.C.; Columbus, Ohio; and Princeton, New Jersey. Eventually the family relocated again to care for his maternal grandfather in rural Meyersdale, Pennsylvania, which came as something of a culture shock. "In the fourth grade I went to a one-room schoolhouse out in the middle of nowhere," Mirkin recalls. "For some kids, it took about an hour bus ride to get to the high school, which had maybe 94 students and drew from many miles around. I didn't have calculus or physics or any real education in chemistry until I went to college." Of growing up in a fairly large family, Mirkin says, "It was wild. My mom had three unstated rules: be home by ten, don't get in trouble with the law, and don't cost me any money. If you followed those three rules you could do anything you wanted." Her tactic must have helped inspire achievement—Mirkin's older brothers became an orthopedic surgeon, a geologist, and physicist. When it's pointed out that none of them chose to go into their father's field, Mirkin replies quickly, "Nobody wanted to compete with him. He was a voracious reader and even though he went to the University of Chicago and Stanford, most of what he knew was self-taught. He didn't care about money or kudos, he just liked learning and knew many languages. Because of that a lot of people liked him and wanted him around. He had high standards, too. I remember taking my first report card home from college and he told me, 'Well, maybe you'll get the reward for most improved student.' That one shocked me." These days Mirkin takes pride in teaching and mentoring not only Northwestern students but also aspiring young scientists and inventors across the country. Through his position at IIN, Mirkin and colleagues devise science programs such as the DiscoverNANO Web site, that presents the fundamental concepts of nanoscience to young learners (although adults may find it helpful, too). He is also working with Chicago's Museum of Science and Industry to develop a hands-on nanotechnology exhibit. Of all Mirkin's current projects, the one that excites him most involves gene regulation, which he hopes will move nanotechnology from the realm of diagnostics into treatment of many diseases, especially cancer. He is working on developing nanoparticles that will enter cancer cells and stop their production of certain kinds of proteins that keep them from dying, as normal, noncancerous cells do. Because the particles aren't toxic, researchers are able to flood an area of the body with the particles without risk of harming healthy cells, unlike chemotherapy, which can be highly toxic. Mirkin thinks nanotechnology's ability to regulate genes may be the answer to medicine's longtime quest to treat particularly lethal forms of cancer, such as glioblastoma, a type of brain tumor whose treatment has improved little in the last 60 years. He is hopeful that gene regulation may be ready for clinical trials in about a year, and available to patients in about seven or eight years. Of course, Mirkin adds, before that point the therapy must be proven to be safe and effective. "It doesn't come down to whether or not you can do it. We can do it. It's whether or not you can deliver it in a way that doesn't cause traumatic side effects." Nobody knows better than Mirkin what such a discovery would mean. "If we can solve the challenge of gene regulation, there will be not only incredible new scientific insights but also extraordinary societal benefits."